V.com weekend vote: How often do you change your strings? May 12, 2017, 9:05 AM · Hmmm, why is my fiddle sounding so quiet, and why can't I quite find the pitch when I'm tuning these days? Must be time for new strings. Of course, strings tend to be expensive, and they're a pain in the *** to change. But even if you manage to avoid changing them for a long time, they will eventually begin to unravel and ultimately, break. I run into all kinds of scenarios with students, and especially with fractional-size violins. Those strings are even harder to find and change. 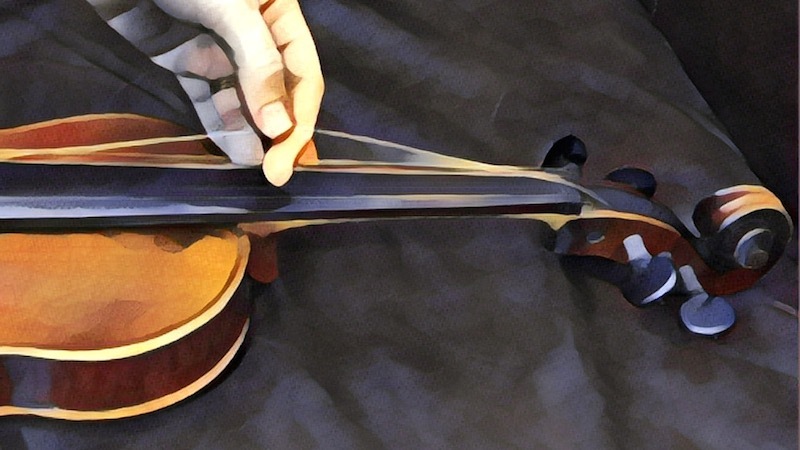 Recently, I realized that a student's very small fiddle had the same strings as it had had back when I was teaching the students older sibling -- at least six years ago! Also, I suspect some places that rent violins just leave them on there until they break - not all, but certainly some. Even with my own fiddle, my intention is to change the strings every six months, but time flies, and it often ends up being longer than that. How about you? How often do you change your strings, and what is your sign that it's time? The calendar, or the state of the strings? Discussion: How often should you change strings? May 12, 2017 at 04:16 PM · About annually. I'm not sure why I do, I'll admit that. May 12, 2017 at 04:53 PM · I change mine about every six months or when a winding comes loose or when I can't play the first harmonic on each string in exactly the same spot or when the open strings don't resonate with fingered octaves. My violin LOVES new strings, sounding so much richer and fuller. May 12, 2017 at 06:05 PM · I had new strings put on my violin in December (Dominant), am anxious to try the new set that I purchased but am waiting until next month before changing them over. If I played more than an hour a day, I'd likely be changing my strings sooner. May 12, 2017 at 06:28 PM · Every three months, because they sound terrible after that. If I'm going to be listening to the violin for two hours a day, I find it worth spending the money to make sure the tone is decent. May 12, 2017 at 06:40 PM · Since I practice daily for a few hours, I have to change every 3 or 4 months. The tone dies and the sound becomes stale. I think it depends on how often you play. May 12, 2017 at 07:00 PM · I play on gut core strings for the wonderful tone, lower tension, unparalleled ringing sound, and incredible dynamic range they provide. However, they tend to degrade after about 3 months; becoming challenging to tune or play in tune. I tend to change my strings every 3-4 months or so. May 12, 2017 at 08:41 PM · Every three months, I give the 'old' strings to my students. May 12, 2017 at 09:53 PM · About once every 5 months. I play 45-60 minutes a day on each of three fiddles. At this rate, it takes about 5 months to rack up 150 hours of playing on any one set of strings. Can count on reliable string performance for about that long. I stagger the three instruments so that I don't end up changing all three sets at the same time. May 13, 2017 at 12:14 AM · I do not have a string-changing schedule. I even used to complain to myself about wasting strings. I change them when my violin is scratchy, muted, dull, whatever or if a string breaks or unravels. Never ran into false strings before. My strings go bad anywhere from seven months to fourteen months depending on how much I play, I think. I've noticed that especially on violins used by beginners, G strings tend to stay on forever while E strings get changed more often because they're so fragile, more so than any other string (maybe except gut strings?). May 13, 2017 at 01:15 PM · I for sure change them when fifths don't work any more. I test them regularly. If a match stick must be held slightly slanting instead of exactly straight across the strings, then I have been playing on strings that were already to old. E-strings get false quite fast. The other ones usually lose tone quality before getting false, after 4 months or so. So then I change them. May 13, 2017 at 01:53 PM · I change strings on my primary instrument every four or five months. Currently, I make the switch when I simply want the crisp, vibrant sound of new strings, or when I am ready to do a little experimenting with a new combination or when I know that I will need a new set soon and want to get past that first week of constantly tuning. My strings du jour are the Evah Pirazzi Gold with the silver-wound G. In my last attempt to find the perfect voice for my violin, I tried the gold-wound G and found that on my instrument it had too much rasp. The silver-wound G works much beter for me. Changing strings is a fun way to give my playing a boost. May 13, 2017 at 08:10 PM · Steel strings create brighter tones and gut strings create warmer tones. This is an obvious truth and has science supporting the why. My upbringing was in the pre synthetic gut string era. There were only gut strings for A, D, and G. If someone had asked the question during this era, “how often should I change my strings?”, it would have been thought a trick question because the answer was so obvious. The answer would have been “when they break”. An “A” gut string had an average lifespan of 2-3 months if played and tuned on a daily basis. A “D” string would last about 4 months and a “G” string would last for a minimum of a year and still produce a warm tone when played. You could always tell a violin player who just experienced a classic “A” string break because there would be a welt on their forehead left after the string snapped usually in the peg box then whipped forward striking the forehead with a painful and audible crack. The D string was not as catastrophic in terms of facial damage but would happen in an equally unpredictable manner. If in concert when this happened, you quickly learned why 5th position was so important. A new era occurred when the synthetic gut string came to the scene. The strings seldom break. Now the question of replacement time becomes a really good one. When synthetic gut strings are first installed their characteristic is more like gut than steel. Their tone is warm and requires more frequent re-tuning. As time goes on the amount of re-tuning becomes less but the tone will transition from warm to bright. Because this is a gradual process, the violinist usually does not appreciate the amount of brightness that has slowly crept into their violin's tone. Had a recording been made right after string installation and compared to 4 months after installation, this brightness could be easily heard in the recording. A string that has been played on one day and on the next day does not require re-tuning is a synthetic gut string that has become a steel string. If warmer tone is what you would like to maintain in your instrument, the strings will need to be changed before they become so stable that day to day tuning is not required. I have found that for my violin this period of stability occurs in about 4- 5 months. For warmth to remain 3 months would be a good time to pick as a scheduled replacement time for these strings. If you do not mind the brighter tone offered by stable synthetic gut strings then they stay as long as you want them to stay because they will not gain any more brightness and these strings will likely take a great deal of time to break. May 14, 2017 at 06:02 AM · Just getting up to an intermediate level here I think- I don't change them very often- not as much as I should- I'm not sure I can yet hear the difference when they get older- I like the harmonic comment above and will try to determine that- I'm spread a little thin on instruments, and got a new harp last winter, that broke a lot of nylon wound strings, so the "final" setup there is slow- and I play classical guitars which I like to change when they start to show wear- but have several now- so maybe the sound deteriorates from stretching before I wear any one set out- Then there's piano tuning, the 5 string viola- and it never ends if I worried over it- so sometimes practice time with older strings is worth more than great sounding strings I play poorly! I've had some cheaper Asian synthetic core strings on the violin for almost a year- almost time to change I guess. Just lowered the bridge some more and had to do some tailpiece filing and chinrest adjusting- so that got in the way. More instruments more permanently dialed in as time goes by, so I'll maybe change them twice a year unless I start hearing them going bad. Ignorance is bliss until then I guess..
May 14, 2017 at 09:08 AM · @ Larry. I disagree with your hypothesis. I change my strings every three months as they LOOSE their brightness and brilliance after this time. I apologize. I should not generalize. I have no doubt that your experience is as real as mine and that your violin and strings lose brightness with time. In my case my violin and strings that I use gain brightness as they are stretched with time. The strings I used for many years were the Dominants but I recently changed to the Red Infelds. For these strings and my violin, both varieties of strings start out warm and end bright. The Red Infelds are warmer in the beginning and stay warm longer. The Red Infelds after about 5 months have gradually transformed to their maximum brightness. Other manufacturers likely use different polymers for the synthetic core so could exhibit different properties when stretched over the months of use. I can only relate my own experience. Sorry for generalizing. May 15, 2017 at 08:28 PM · Larry, don't apologise, part of the fun of this site is that we all have our own opinions and experiences. Your reality is as true for you as mine is for me.